It wasn’t bikeshedding, it was pretty productive. Sunday afternoon: it’s cold, snowing, there’s a crocheting workshop going on in the hackspace, and the distinct clatter of bolts and steel parts hitting the floor can be heard. I’m now at the point where I have got a rough CAD model of the chassis of Clasohlsonkart – basically a rectangle shelled out to 3mm which is a pretty okay representation of what I have to work with so far. After spending the afternoon freezing cold disassembling the parts previously bolted onto the chassis it was time to figure out the drivetrain. 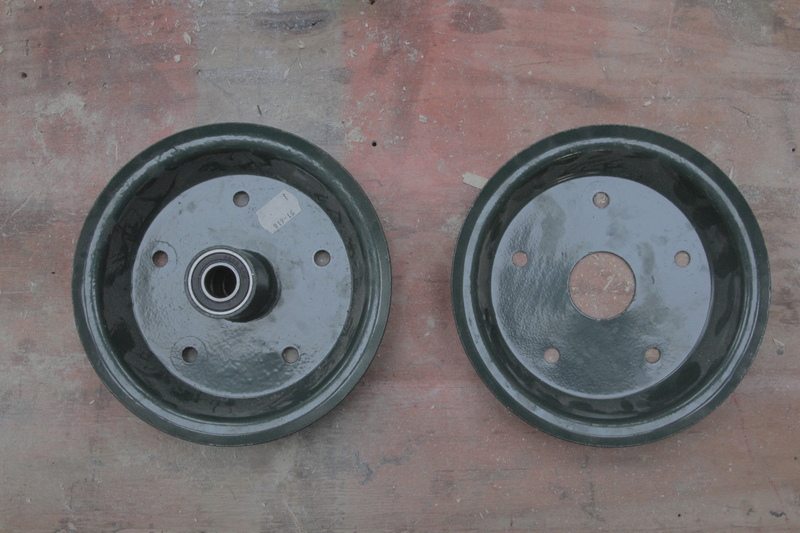 The first plan I came up with was to adapt the wheel hubs to have a sprocket mount. This would be relatively easy to do as the hubs are two parts, and held together with 5 bolts. My idea was to initially create some steel standoffs that will essentially extend the bolts outwards, to then mate with a hub that would carry a sprocket and bearing (essentially an adapter between the sprocket mounting pattern and the hub mounting pattern). This was around half an hour’s worth of work in Fusion 360 – and a pretty good crash course at that. Once I found how to print a plan at 1:1 scale, I printed off the hub, cut it out and it fit wonderfully! This was the plan I was going to stick with as it would allow me to do things like independent rear wheel drive in the future, and would be a little bit easier to make (although probably taking twice as long due to the amount of machining involved). I’ve yet to model this up but it seems like it should work. Aidan wandered out of the workshop, saw me crouched surrounded by a pile of parts and laughed a little. I explained that I was planning out the drive train to which he mentioned having a driven rear axle. It’s like a whole new world out there. We started brainstorming, tabs with parts suppliers were flying, tea was being consumed at a substantial rate, and ideas were being bounced off each other. Eventually the plan that was decided on was to have both rear wheels fixed to one axle, with a sprocket & adapter positioned somewhere on this axle. The advantage of doing things this way is that there is flexibility in placing the motor anywhere within the kart just about, and it will make it easier to support the rear wheels. It looks like 16mm steel rod should be good enough for the axle, but modelling it all up properly in Fusion 360 should allow me to test that. Fingers crossed come pay day I can start ordering parts in, but I might wait till I’ve got the design done first so it’s a somewhat known constant then.